It was almost 2 years ago that I was in Morocco on the occasion of the Muslim celebration of Eid al Adha, more commonly known as the Feast of Sacrifice, a celebration of significant importance in the Arab world which marks the end of the annual Hajj pilgrimage. I had crossed into Africa by ferry from the Spanish port of Tarifa and completely by accident found myself at the beginning of the preparations for the festival in Tangier. 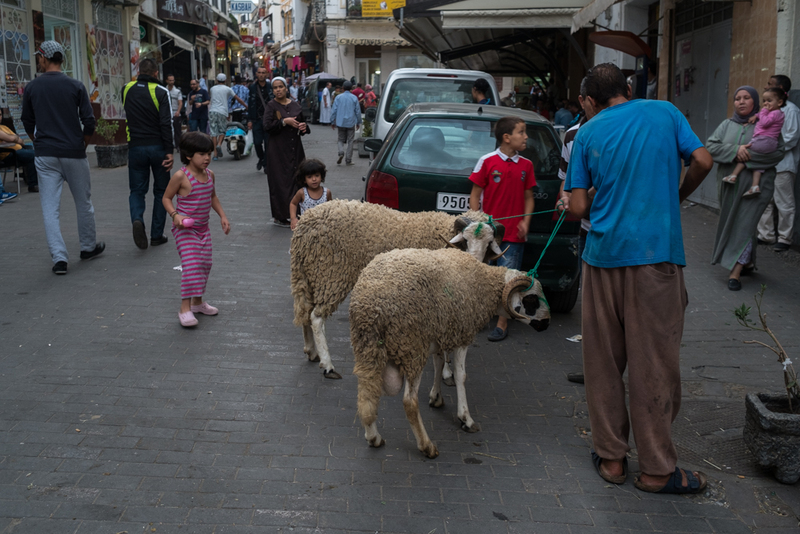 Sheep and goats were herded through the city streets, loaded into cars and busses and chased through the colourful narrow streets of the medina. 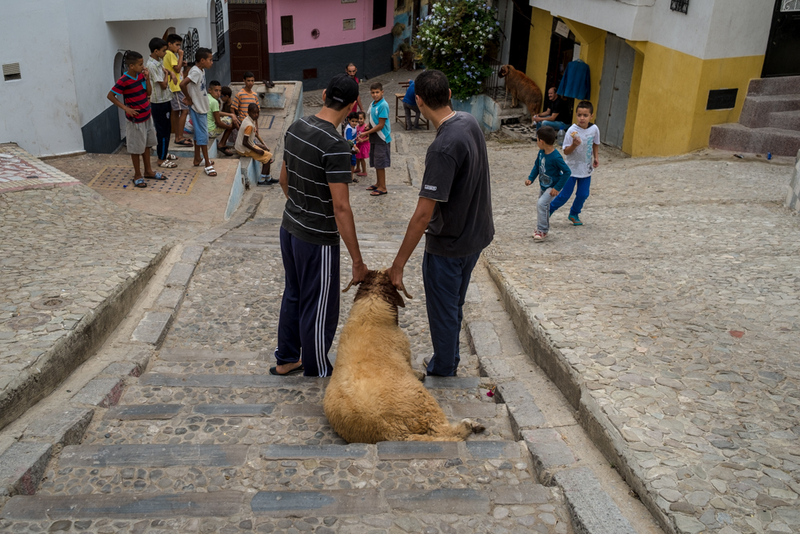 Adults and children were excited as the animals neared their own homes, children rushed to greet them and local families keenly watched as sheep and goats were tethered outside in the medina. Residential areas became temporary livestock quarters. 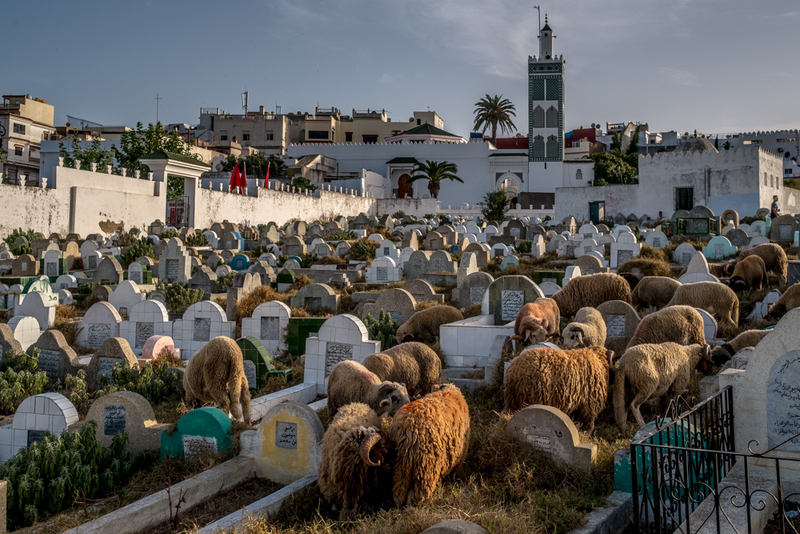 In the Muslim cemetery adjacent to the strikingly green Marshan Mosque hundreds of feted but fey animals grazed on the grasses between gravestones, shepherds watching and ensuring their short term safety. Walking back into the city, the spinning wheels of grinding machines noisily announced the incipient celebration as men queued with knives at the roadside hardware shops lining the Avenue d’Anglettere. I travelled to Chefchaouen in the Rif mountains several days later on the first actual day of Eid. The old bus chugged through Tetouan before turning right and taking the winding road into the Rif foothills. Outside of Tetouan the bus passed the huge waste refuge site on the left and the smoke from its eternal fires drifted across the road, semi-obscuring the myriad plastic bags and other debris the wind had blown from the rubbish tips. When I arrived in Chefchaouen a little later another thick pall of smoke was evident, and this hung like a cloud over the blue city. 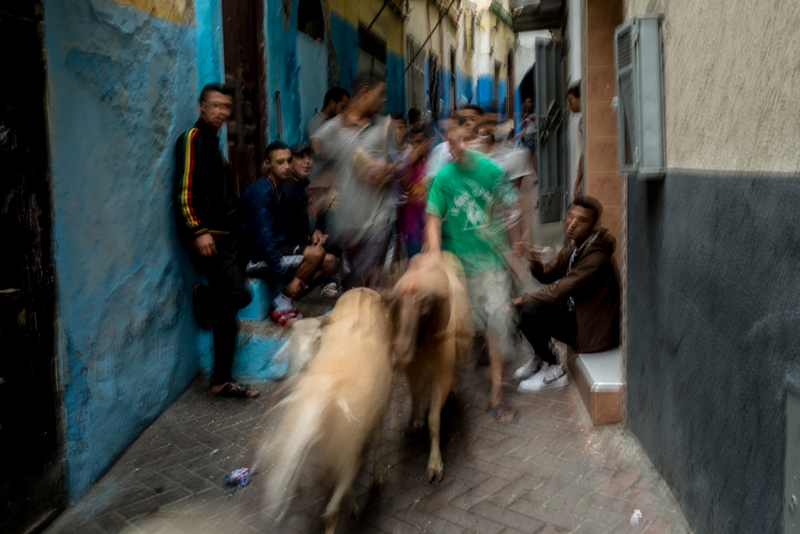 The air had a heaviness and thickness I had never associated with the city before and a clinging smell of barbecue permeated the roads and lanes as I made my way to my hotel in the Medina. It was clear that many animals had been ritually killed in halal fashion that morning and their distribution to other family members and the poor, and their subequent cooking, went on into the afternoon. I considered it was probably little different than our custom of eating turkey at Christmas; the major difference appeared to be that the slaughter of turkeys is a more remote practice. 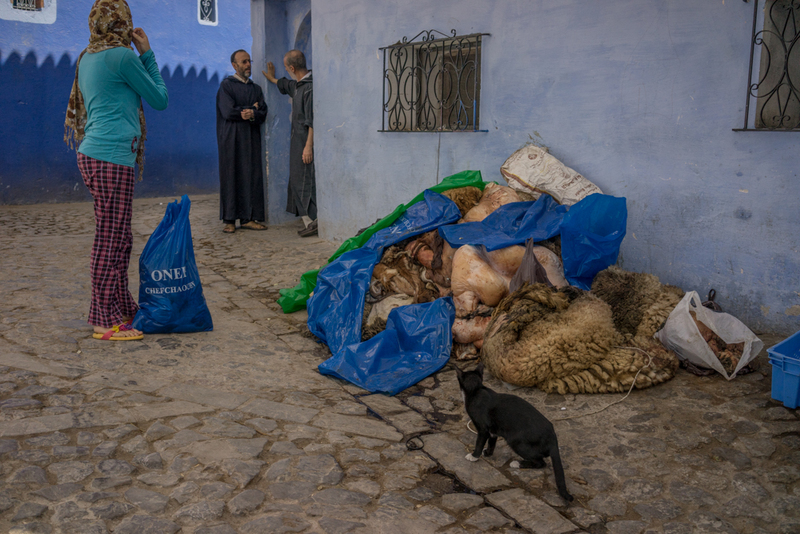 In Chefchaouen the killing of the animal was an intimate and important part of the ritual and either performed by the adult family member with the appropriate skills or local neighbour who possessed them. If the latter, the family member was also present. The ritual, for which there are complex guidelines ( see below ), is called Qurbani, or Udhiyah as it known in Arabic, and describes the sacrifice of an animal to Allah during the period of Eid ul Adhar. It is based upon a story of Abraham/Ibrahim which can be found in both the Quran and the Bible. It is said that Ibrahim had a dream one night, in which Allah told him to sacrifice Ismail, his beloved son. At first Ibrahim thought it was the devil playing tricks on him and he immediately disregarded it. However the following night, the same dream occurred again commanding him to do the same. Ibrahim then came to realise that this was no fluke and in fact, a message from Allah. Ibrahim loved his son, Ismail. Yet he was fully prepared to follow Allah’s command and do as He instructed. He took his son to Mount Arafat along with a knife and rope. Upon reaching there, he told his son about his dream and what Allah had commanded him to do. Being an obedient son, Prophet Ismail immediately obliged and asked that his hands and legs be tied so that he may not struggle and that his father blindfold himself so that he won’t have to witness him suffer. Ibrahim did as Ismail had said. Blindfolded and with the knife in his hands, he did as Allah had asked of him. When he took the blindfold off, to his surprise, he saw the body of a dead ram in front of him. Ismail was completely unharmed standing right next to him. At first he thought that something had gone horribly wrong and that he had disobeyed the order of his Creator. But then he heard a voice telling him that Allah looks after his followers and that he need not worry. Unlike prayer (Salat) that is compulsory for every Muslim, Udhiya demands that certain criteria must be met in order to be eligible for Qurbani. Any sane, adult, Muslim male or female who possesses the Nisab ( level of wealth ) amount for Zakat ( the compulsory giving of a set proportion of one’s wealth to charity – the third Pillar of Islam ) must also perform the duty of Udhiya. Udhiya can only be performed after the Eid-ul-Adha prayers from the 10th of Zul-Hijja to the 12th of Zul-Hijja (the last month of the Islamic Calendar). This means Muslims have three days to perform this ritual. If it is performed before the allotted time, it must be repeated. If performed after the time has passed, then Qurbani was not properly conducted and will not be accepted. As it is considered a sacrifice to Allah, the health and condition of the animal is also very important. Animals that are weak, blind, physically disabled, or those who are young, have broken horns or no teeth are ineligible. Regarding the types of animals that can be used for Qurbani, people generally opt for a goat. However sheep, cow, bull, buffalo or camel are also acceptable. If an animal has been selected for sacrifice, it is not permissible to sell it or give it away, except in exchange for one that is better. It is mustahabb (liked, preferable) for the one who has made a sacrifice to not eat anything on that day before he eats from it, if this is possible. People can make as many Qurbanis as they want – for example two or three shares in a cow – and on behalf of as many individuals as they like, including those who have passed away. The meat from Qurban should be divided in three equal parts – one for the home, one for relatives and friends, and one for the poor and needy. The meat from Qurban can be distributed to the poor or rich, Muslim or non-Muslim. It is possible to purchase shares for other people in other countries and, because of the relative lack of poverty in Western countries, many Muslims prefer to have their Qurbani performed in poorer countries or those in dire need, and the meat to be distributed to the neediest or those suffering adversity and poverty. A full description of the rules and guidelines, together with their liturgical justifications, can be found here. Throughout the 3 days of the festival Chefchaouen was very quiet. Many shops and stores were closed and people walked around the city wearing finery. Greetings between friends on the alleyways were extremely decorous and respectful, with much smiling, extended shaking of hands and repitition of ‘Eid Mubarak’, or ‘blessed Eid’. The streams of people which left the central mosques following the completion of services suggested that worship formed a central part of the weekend. 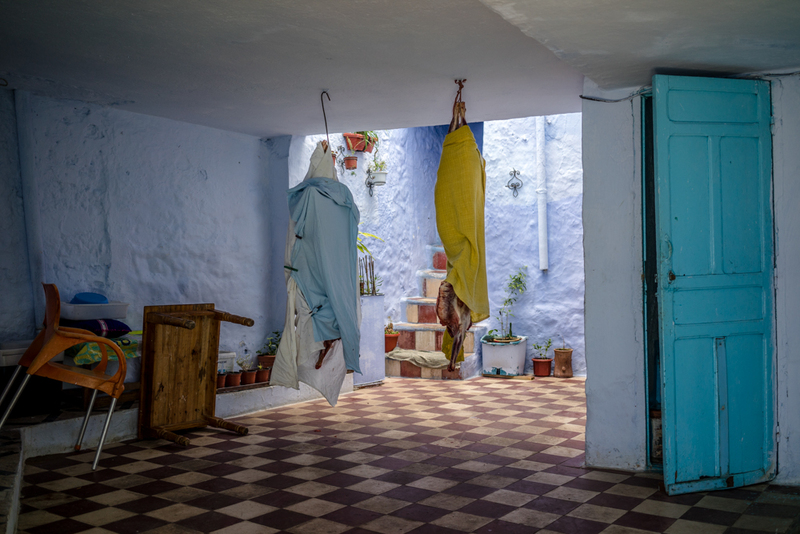 Both outside of homes and in their courtyards barbecues with cooking tools could be found and in some spaces animal carcasses wrapped in cloth were hanging on large metal hooks from ceilings. Along the lanes every so often piles of skins and offal were stacked against walls, awaiting for disposal.